Our kind of town, Chicago, is. 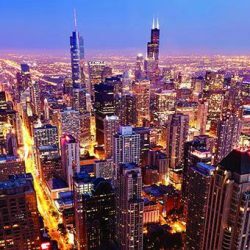 Though it’s been dubbed as the Second City, Chicago, Illinois, some could argue that Chicago is the greatest city in the world. Located right on Lake Michigan, the Windy City’s landscaping and architecture is some of the most unique around. After the Great Chicago Fire of 1871, Chicago was rebuilt from the ground up into a central hub for architecture, museums, universities, entertainment, food, and is well-known for its diverse neighborhoods. After the 1893 World’s Columbian Exposition, Chicago became a destination worldwide and became so much more than the city that links east to west. Chicago’s skyline is one of the most beautiful in the world, as its sweeping line is punctuated by some of the world’s most famous buildings, like the John Hancock, and the Willis Tower, though locals still call it by its former name, the Sears Tower. This metropolitan city is home to the world-famous Art Institute of Chicago, the Field Museum, the Adler Planetarium, the Museum of Science and Industry, and so many more. Cloud Gate, aka “The Bean” enthuses visitors from all around and marks the location of Chicago’s Millennium Park, right in the heart of Chicago’s Loop. Navy Pier is a historic and entertainment filled destination, bustling with shops, restaurants, Chicago’s famous Ferris wheel, and the Chicago Shakespeare Theatre. Many visitors and residents visit the pier to take a boat ride on the beautiful Lake Michigan, or even up the Chicago River to be awed by its architecture and history. Chicago has also been dubbed “restaurant city” and has attracted chefs all over the world to call this city home. Chicago is more than just its famous deep-dish pizza and satisfies culinary lovers to its incredible restaurant offerings. The West Loop is a hub for these culinary masters, but you can find great food everywhere you go. Chicago is famous for its sports teams. The Northside is hailed by the Chicago Cubs, while the Southside has the Chicago White Sox. The Chicago Bears, Bulls, and Blackhawks are cheered on by all. Chicago is also famous for its entertainment. Chicago has one of the best theatre scenes in the world and is home to the Steppenwolf and Goodman Theatres. Chicago is also a huge hub of improv and stand-up, most notably iO and The Second City, but Chicago is best at its music. Music festivals are held all year round, most notably Lollapalooza, but music is played every single night in this amazing city. Chicago is home of the blues, gospel, and jazz. You can find great music everywhere you go, whether it be The Green Mill, Kingston Mines, or Howl At The Moon, you’ll be dancing and singing all night long. Howl at the Moon is the country’s biggest name in Dueling Piano entertainment. Howl2GO delivers our amazing, high energy show to any venue in the Chicago area. When you bring Howl2GO to Chicago, you can be certain you’re getting the true Howl at the Moon experience, and with that comes the assurance you are booking only the best dueling piano performers in the country. Our fun, energetic performers are perfect for all events anywhere in the Chicago area. Howl2GO provides all the production you need to make your event look and sound amazing. We have top of the range PA sound systems and custom built lighting shows that you will not see anywhere else. Our competition simply does not begin to come close to our production! We also supply our custom built electric baby grand pianos that can be transported into any size or shape venue in the Chicago area. Regardless of how many guests you’re expecting, from 20 to 2000, we have you covered! Howl2GO Dueling Pianos by Howl at the Moon brings only the absolute best entertainers to your event. Whether you’re planning a corporate event in Chicago, a wedding or private party at your home, we’ll deliver customized entertainment leaving you and your guests dancing and singing along all night. 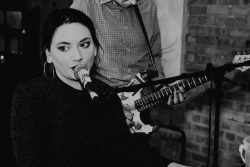 We are the first choice for all types of school, church and charity fundraisers and we ensure all our songs and material is suitable for everyone in attendance. Telling your guests in Chicago that Howl at the Moon is providing the entertainment, is a sure fire way of attracting more people to your event! Dueling Pianos in Chicago is all we do! Howl2GO has a dedicated team of professionals on staff. From our sales manager who will help build out your vision, our production team who will communicate with your venue in Chicago, a wedding specialist and, of course, our world-class entertainers, picked specifically for your event. We only bring Howl at the Moon trained musicians, all of whom have experience playing at one of our locations nationwide. We are a perfect choice for your wedding – we keep numerous couples in Chicago and their guests dancing all night, as well as taking care of all your ceremony, announcements and special family dance needs. Don’t risk booking a local fly-by-night company that may not even still be in business when your wedding date comes around, nor one that hires freelance players. Howl at the Moon has been rocking since 1990 and our reputation precedes us. We have a dedicated reviews page so you can read testimonials from hundreds of our thrilled clients in Chicago. Our Facebook page features regular updates, and following us on Instagram and Twitter means you’ll stay up to date on where we’re playing next near Chicago IL.